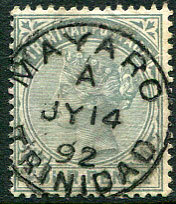 (T.2) dated A/JY 14 92 on QV 4d grey (SG.110). 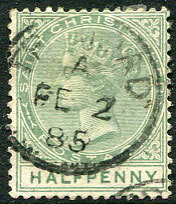 arrival dated A/FE 2 85 on QV ½d dull green (SG.11). (T.1) A/MY 21 90 on QV 1/- (SG.112). 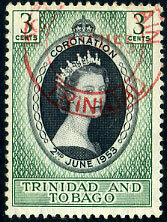 (T.7) 7 AUG 59 on QE2 1c, 4c (SG.267,270) piece. (T.10) 17 OC 79 on 2 x 5c fragment. 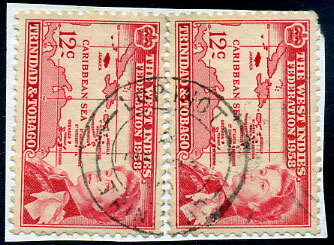 (Type 0.7, large figures) dated 18/OC 22 1880 on pair (1d) scarlet (SG.75c). (D2) partly dated A/-- 23 -- on 2 x QE2 12c Federation (SG.283) fragment. (T.2) A/JU 9 91 on QV 1d (SG.107). (T.10) 4 JY 50 on 3 x KG6 1c (SG.246) piece. 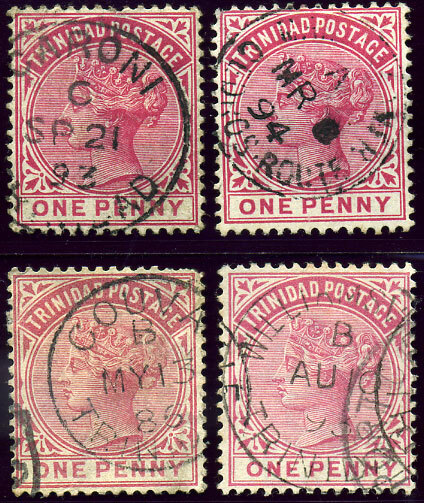 (T.2) C/JU 18 97 on 1d Britannia (SG.115). 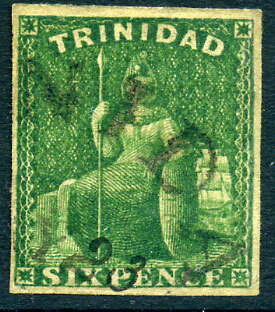 (T.10) showing reversed first D in TRINIDAD dated 20 NO 50 on KG6 4c (SG.249a). (T.2) C/AP 15 90 on QV 1d (SG.107). (T.2) A/DE 1 92 on QV 1d (SG.107). (T.3) A/JY 12 17 on 1d WAR TAX (SG.180). (T.4) A/DE 28 07 on 1d Britannia (SG.135), light diagonal crease. 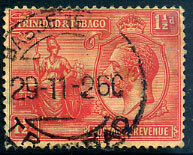 (T.3) C/FE 18 27 on KGV 1½d (SG.220b). (T.2) A/JY 8 68 on QV 1d (SG.107). 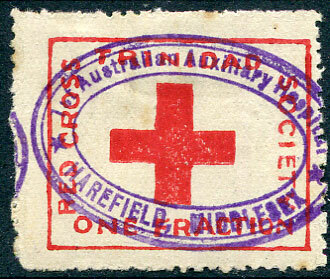 on KGV 1d, 2d (SG.219,222) fragment. in italics on QV 1d (SG.107), some creasing and thinned corner. (0.7 large) dated 23/DE 24 1880 on 1/- chrome-yellow P.14 (SG.78). (T.5a) 29-11-26 on KGV 1d (SG.207), weak corner perf. (T.2) A/OC 24 94 on QV 1d (SG.107). 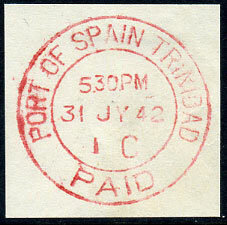 (T.2) A/FE 4 87 on QV 2½d (SG.108), soiled appearance. (PP2) A/JA 30 01 on pair 4d Britannia (SG.118, Cat.£48). (T.2) B/JY 27 88 on QV 1d (SG.107). 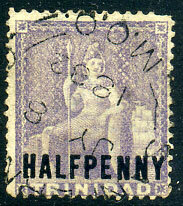 arrival dated C/SP 30 91 on QV 2½d on 1d (SG.55), some perf. faults. 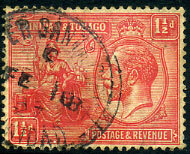 on 1906 2½d Britannia (SG.107). C/SP 25 19 on 1d War Tax (SG.188). 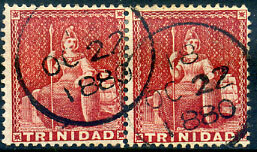 (Proud PD8) in red dated 31 JY 42 with I C below on envelope cut-out piece. 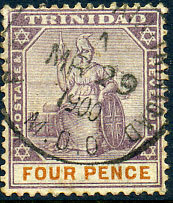 (Type 0.2) on 1/- mauve (aniline) CC wmk (SG.73b), perf. defect middle right margin. (T.2) reversed B/JU 27 90 on QV 1d (SG.107). 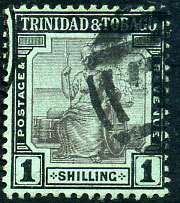 (T.2) C/NO 12 95 on QV 1d (SG.107), thinned. (T.2) sideways facing up B/JY 4 18 on 1d (SG.150a). 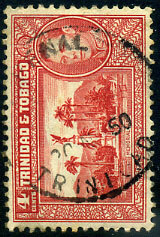 (T.2) B/JY 5 89 on QV 2½d (SG.108), thinned top left area. 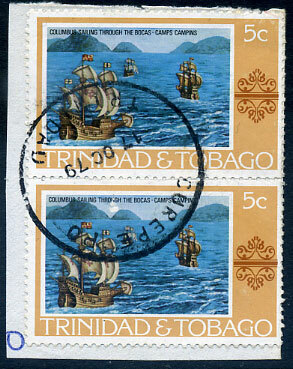 A/DE 17 87 on QV 1d (SG.107). 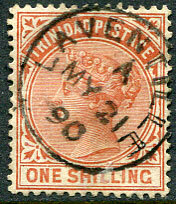 dated reversed C/AP 4 09 on 1d Britannia (SG.135). dated A/JU 7 86 on QV ½d (SG.106). dated A/MR 21 86 on QV 1d (SG.107). (T.2) A/SP 19 94 on QV 1d (SG.107) with affixed printed advertising hinge of "Les Maisons Reunies", Lisbonne, Portugal. Toning. 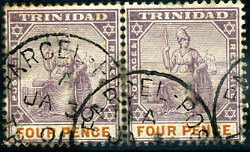 (T.2) scarce B code inverted and reversed/11 JY 95 on QV 2½d (SG.108).